In a back alley in Brunswick, a grown man is behaving like a kid. Dean Sunshine should be running his family textiles business. Instead, the lithe, curly-headed 50-year-old is darting about the bluestone lane behind his factory, enthusiastically pointing out walls filled with colourful artworks. It’s an awesome, open-air gallery, he says, that costs nothing and is in a constant state of flux. Welcome to Dean’s addiction: the ephemeral, secretive, challenging, and sometimes confronting world of Melbourne street art and graffiti. For a complex set of reasons, street art has flourished in Melbourne over the past 20 years, to the point where its tourist-draw has forced local governments to not only tolerate but even embrace certain aspects of it. 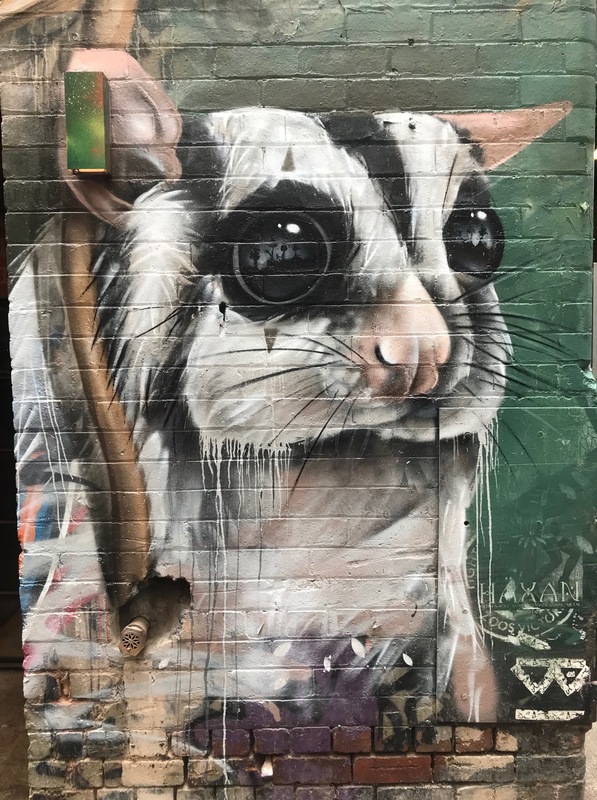 These days, councils including the City of Melbourne make a distinction between acceptable street art (artistic works done with the permission of building owners) and illegal graffiti (any writing or images carried out without proper permission). As a movement, street art is entering the mainstream. In 1984, American artist Keith Haring put the spotlight on street art when he painted several murals in Melbourne, including an iconic wall that survives today at the former Collingwood Technical College. Meanwhile, young, mostly male, graffiti ‘writers’ made their illegal marks on trains and train lines around Melbourne. And, thanks to the city’s topography (easily accessed and plentiful lanes tucked away from prying eyes), not-to-mention its rich artistic scene, street art began to rapidly evolve. 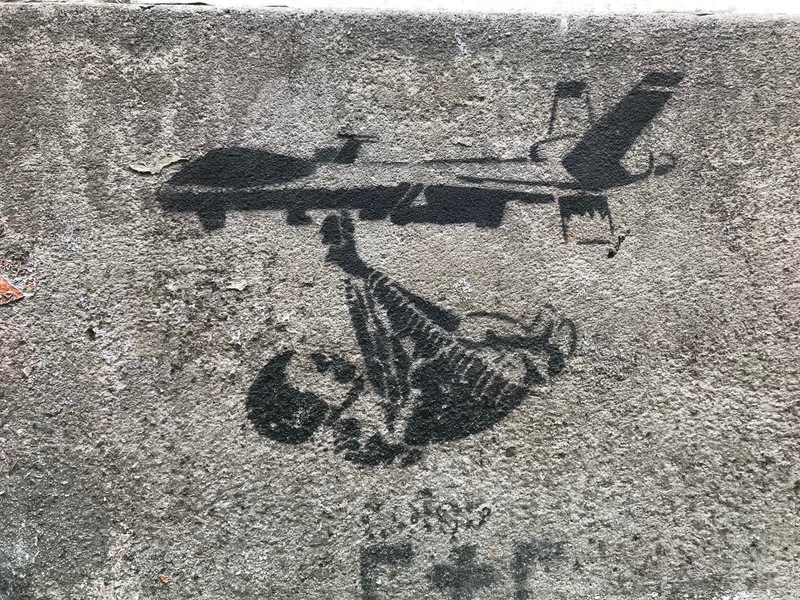 By the early 2000s stencil art emerged as a genre above all others. These clever, often provocative images cut into card and then painted onto surfaces earned Melbourne an international reputation, bringing artists and admirers from near and far, including British street artist Banksy, who left several stencilled deep sea divers and parachuting rats around the city, in 2003. Local artists continued to test boundaries with police, producing more elaborate works in bolder, more publicly visible places. “It was exciting,” recalls Berlin-born art curator Jan Dirk Mittmann, who ran the Melbourne Stencil Festival from 2004 to 2008. “Stencils were popping up like mushrooms in various lanes and back streets around Melbourne. But it was also very underground.” Then, in 2005 authors Carl Nyman and Jake Smallman made the reputation official with their book on the scene – Stencil Graffiti Capital: Melbourne. Of course, the street art scene here hasn’t stayed still. Today, private building owners and councils including Melbourne, Port Phillip and Yarra regularly commission works; street art agency Juddy Roller has brought the movement to regional Victoria through the Silo Art Trail and the Benalla Street Art Wall To Wall Festival; and, while Melbourne street artists such as Rone, Adnate, Lushsux and Smug may not be household names yet, their combined 560,000 Instagram followers suggests that interest is certainly building. The art collectors are getting on board, too. Melbourne-based couple Andrew King and Sandra Powell sold an impressive collection by artists including Sydney Nolan, Albert Tucker and Brett Whiteley after stumbling across books Banksy and French street artist Blek le Rat on a visit to London, in 2008. “At that moment I just realised the audacity and the derring-do and the incisiveness of the social commentary,” says Andrew. “I bought the books and that was it.” Today, the pair, known as SANDREW, has amassed more than 2000 works by street artists, including the largest Banksy collection in Australia. 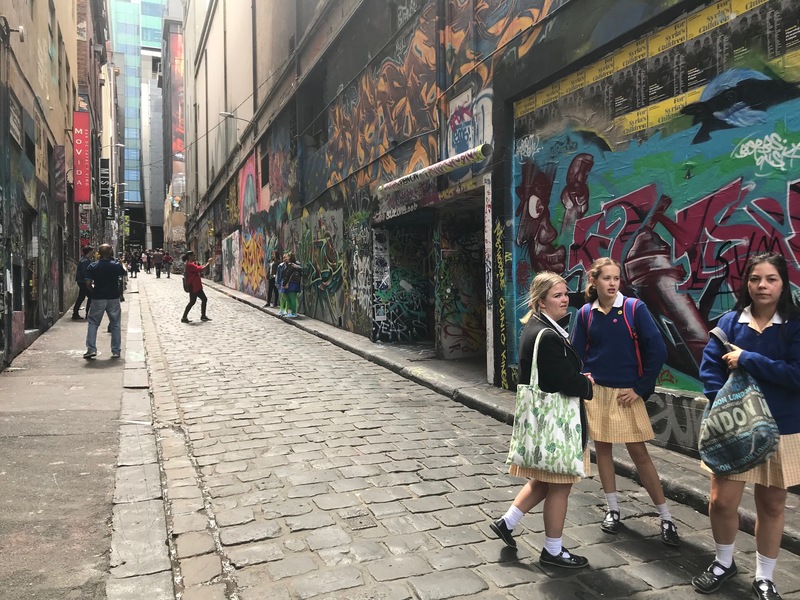 It’s Tuesday, just after lunch, and we are standing in what our guide Dan calls “the kiddie pool”: Rutledge Lane, a U-shaped, dumpster-lined alley that runs off the city’s most famous graffiti spot, Hosier Lane. It’s where many graffiti artists make their start and the walls have become so heavily adorned over the years that in places you can peel off layers of paint as thick as your finger. Dan, a street artist himself, who uses found objects to create clever sculptures under the name Junky Projects, is taking us on a street art tour of the city run by Docklands’ Blender Studios. Our group, which includes a Singaporean family of three, a Dutch twenty-something, a young guy from Brisbane and two Kiwis, are here because of Melbourne’s international street art reputation. Back in Hosier, we stand aside while a troop of uniformed primary school children streams past; the lane is otherwise thick with camera-wielding tourists jostling for prime position in front of the art. 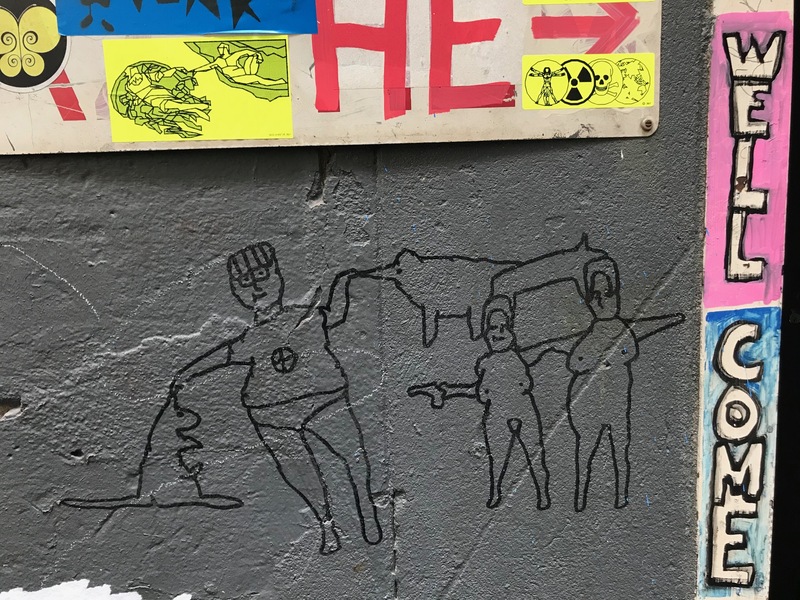 Later, Dan has us trawling through a few lesser-known laneways, eyes peeled for the tell-tale signs of particular artists: the concrete sculpted goon bags and firearms of Will Coles; the geometric-line drawings and of Sunfigo; and yes, even a parachuting rat or two from Banksy. Soon I begin to see art almost everywhere I look. Maybe, I think, this is how the addiction starts. 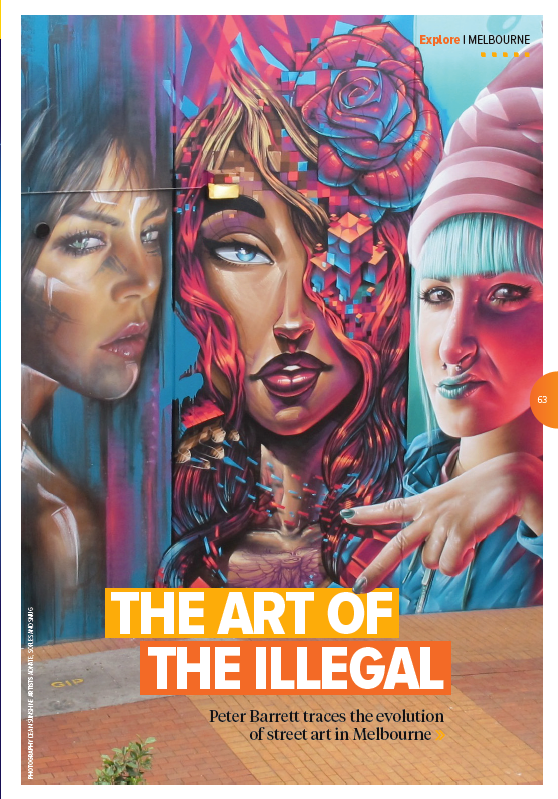 This story, The art of the illegal, was first published in the January issue of Jetstar magazine in Australia.